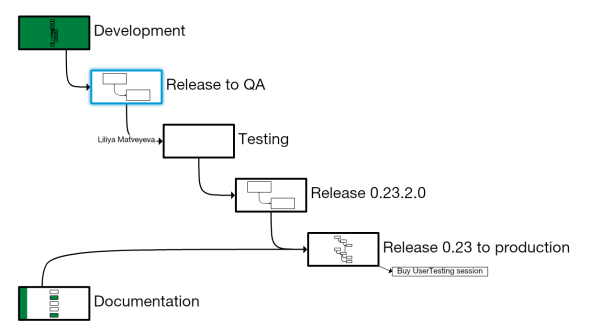 There are all kinds of repeated work that you find yourself doing: scrum sprints, version release procedures or even following some setup guide. These are all examples of things you should only be planning once and then executing a few times. In Gigantt, this is trivial to do. You just copy and paste some existing work and repeat it. Let's see an example. Something close to home. When we, in Gigantt, are about to release a new version, we first release it to our QA environment for thorough testing. This is like a dress rehearsal for the product before it goes live, so there are quite a few steps that must be followed along the way. This is basically a check list, and we repeat it every time we release a new version to the QA team. But unlike a traditional check-list, all the tasks here are already estimated, their order and dependencies are well known in advance, and each task is assigned to the relevant person. Pretty simple, but powerful stuff. It's powerful because it lets you keep all these "recipes" in Gigantt for stuff that you do repeatedly, so you have your documentation right there in your work plan. If you decide to add another step to your recipe, you add it to that template task and be sure it will never be skipped in the future. So what's new? Copying and pasting tasks is a feature we've had from day one. But now you can also copy and paste tasks between plans. This means you can create separate "repository" plans just to keep track of recipes or experimental plans. You don't need to "pollute" your project's work-plan with recipe tasks that don't really belong there. For example, you wouldn't want these recipes to actually get scheduled by our automatic task scheduler - you want them to just sit there so you could copy them every now and then. You can also use "greenhouse" plans as a place for very early project planning. Meaning, you can create a work-plan for a new project in its own plan, and not worry about messing up everyone's schedule until you've properly planned and estimated all those new tasks. When it's done, you copy it into the "real" plan in one step. Copying tasks between plans is the same as regular copying. Ctrl+C puts tasks into your visual clipboard; then you open the target plan (e.g. in a new tab) and paste there. The short story: as of today, the mouse-wheel is used to scroll up & down in Gigantt, not zoom in & out. To zoom, use the zoom buttons or the keyboard shortcuts (+, -). From day one we envisioned Gigantt as a zoom-able mind-map for project planning. Our inspiration came, among other sources, from online mapping applications, where the mouse wheel is used to zoom in and out. For example, that's how Google Maps does it, and we tried to make zooming as intuitive as possible to anybody who's ever used Google Maps (which is everyone, right?). This, it turns out, was dead wrong. 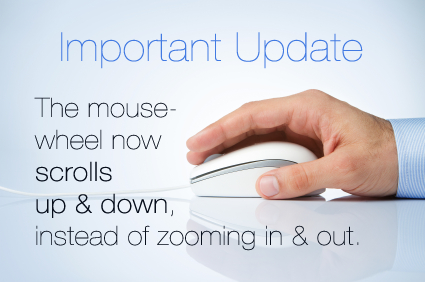 For too many of our users, who are very accustomed to using the mouse wheel to scroll up & down, this default zoom behavior was very surprising and hard to get used to. It is mainly for their sake that we're introducing this change. To our dear, loyal, existing users, we're sorry for the hassle of having to get used to this new behavior. Another reason is we observed that most of our users don't really do a lot of partial zooming. They either step into a task completely (e.g. by double clicking on it) or step outside (by double-clicking outside or on the Zoom Out button). Zooming in partially is something our users do rarely - usually when they have too many tasks in the same container and they're too small to read comfortably (hint: use the collapse feature). The one place where incremental, partial zooming is very useful is Team View. In team view you can zoom out and see thousands of tasks on the screen at the same time, so it's really important to be able to zoom just enough to see what you want to see. We think this is still pretty easy to do with the zoom buttons. Again, you can also zoom with the keyboard shortcuts +/- and you can change the time resolution with Ctrl +/-. Exciting new features have landed today. Two new views that show tasks in color based on the resources assigned to them. In both Duration and Future view you can switch colors on/off. Colors let you focus on who's doing the work inside each task, instead of seeing the sub-task structure. In Duration view you get a "tree-map" visualization, where the size of each colored rectangle stands for how many work-days go into each task and its sub-tasks. 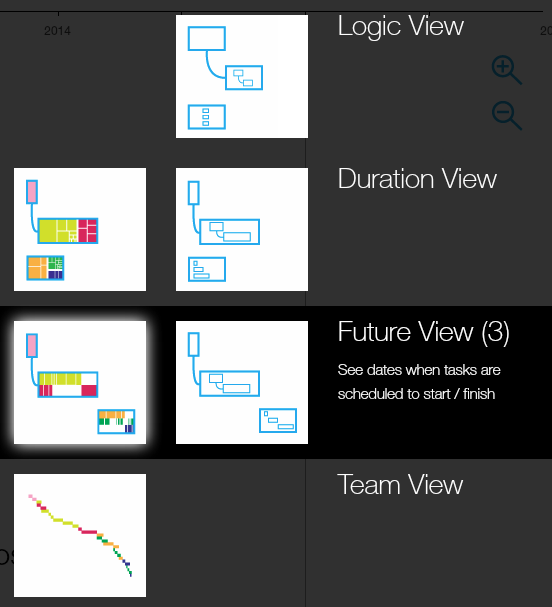 In Future view you see a timeline per resource within each task. This makes it a lot easier to identify blocked tasks, who's waiting for whom - that sort of thing. The keyboard shortcuts are still the same. Hit 2 once to switch to duration view. Hit 2 again to turn color mode on, and again to turn it off. Same with 3 (future view). We've also beefed up the view selection drop-down. It's bigger and hopefully helps understand what each view is good for. Naturally, since things are getting a lot more colorful, you can now customize your organization's resources and select the colors you like best. A small face-lift to our user interface to brighten things up.